Health insurance is supposed to cover medical expenses. That, after all, is what it's for. But at a time when premiums are rising, consumers are finding they are also paying more out-of-pocket for their health services. Kalorama Information, a healthcare market research publisher, has crunched the numbers and found that consumers' out-of-pocket spending on medical services rose to $486 billion last year. Consumers are required to pay up for a couple of reasons. Sometimes their insurance doesn't cover all or any of the services they receive. For example, if they receive services from a provider not in their network, the insurance might not pay as much. Another big reason for the increased out-of-pocket spending is that policy deductibles continue to rise. 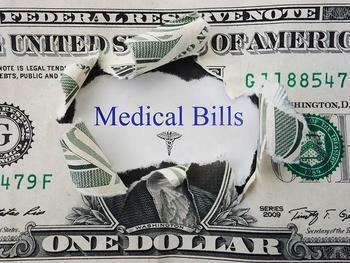 In some cases a consumer must pay the first few thousand dollars in medical expenses each year before coverage kicks in. According to Kolorama Information's data, the average out-of-pocket spending for an individual consumer last year was $1,400 – up from $250 in 1980. Even adjusted for inflation, that's a 45% increase. Meanwhile, consumers are paying more for their healthcare policies. In a report last October, the Department of Health and Human Services (HHS) disclosed that health care premiums under the Affordable Care Act (ACA), also known as Obamacare, would go up an average of 22% in 2017. In Minnesota, the rise in premium rates was breathtaking. Minnesota Commerce Commissioner Mike Rothman warned that rates for individuals and businesses would increase to the point of not being sustainable. With consumers having to pay higher rates for coverage and spend more out of pocket, the Kalorama Information found more of them are financing medical costs with plastic. While cash made up the largest category of payment, credit cards was second. Close behind was lines of credit. The costs, the report found, have risen 8% each year since 2011.